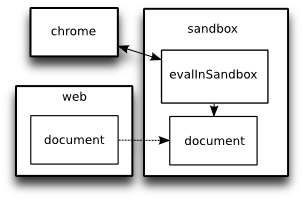 "chrome": the browser itself and any extensions that are installed. These can essentially do anything. "web": HTML/XHTML/XML/etc pages loaded in a browser window. These have limited privileges - they can't read information from different domains, access local files, or call any of the "chrome" functions. A lot of the practical effects of using XPCNativeWrappers are explained in Mark Pilgrim's Avoid Common Pitfalls in Greasemonkey, written a couple of years ago when Greasemonkey was altered to make use of XPCNativeWrapper in order to avoid security holes. Opera, Safari and IE all have either built-in or third-party support for user scripts, but no details on whether there's any kind of secure sandbox in which they're executed.